During your visit, Toppik will automatically collect and temporarily store some basic information about your computer and your visit. When you view our Site, we may store some information on your computer. This information will be in the form of a "cookie" or similar file. "Cookies" are pieces of data stored on the visitor’s computer tied to information about the visitor. Information gathered through cookies and web server logs may include information such as the date and time of visits, the pages viewed, time spent at the Site and the Sites visited just before and just after our Site. We may also use information gathered from cookies to personalize your visit, to gather information and statistics about visits to our Site, to better understand visitors’ online behaviors, and to help select and display targeted advertisements that we believe may be of interest to you. If you make a purchase from the Site, participate in any contests posted on the Site, join our Toppik VIP program or provide us with testimonials, photos, videos or comments, we may request that you voluntarily provide us with personally identifiable data such as your name, address, email address, telephone number, credit card information and other personal information. This personal information is used for our internal tracking purposes, to process payment and order requests, information correction, internal records, and in order to contact you to respond to your questions, to inform you of any product or promotional offers that we may run and provide you with information we believe may be of interest to you. We may also collect personal information which our users provide about other people in the case of referral, gift purchases and deliveries to alternate addresses. We will not sell, share or otherwise distribute your personally identifiable information to third parties except as provided herein. We may share the information you provide to us with our affiliates, any subsidiaries, strategic partners, authorized distributors, successors or assigns or any entity merged with or into Toppik. You may have your information removed from our database by contacting our Customer Service department at 1-800-844-2536. 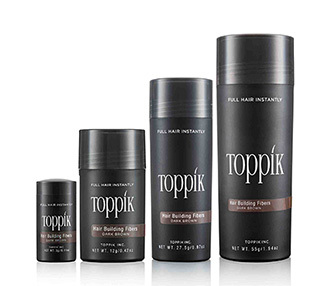 As noted above, if you join our VIP program, you may receive promotional emails from Toppik or one of our affiliates. You may unsubscribe from our mailing list by using the provided link in any of these emails. Under California law, California residents have the right to request in writing from the businesses with which they have established a business relationship: (1) a list of the types of personal information (e.g. – name, email address, shipping address, etc.) and types of services provided to that person, that the business has disclosed to any third parties, including affiliates that are separate legal entities, during the immediately preceding calendar year for direct marketing purposes by the third party; and (2) the names and addresses of all such third parties. To request this information, you can email us at: support@toppik.com or write to us at TOPPIK Products, Church & Dwight Co., Inc. 11845 W. Olympic Blvd., Ste. 900W Los Angeles, CA 90064. We will respond to these requests for information within 30 days following receipt of your email or written request for information.